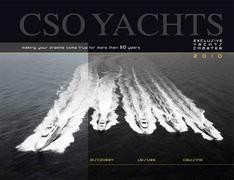 Adrien Camellini, Charter Fleet Manager at CSO Yachts, tells me that their new charter brochure was recently delivered and is also available to view online. Published in English and French, it runs to some 160 pages and has a large landscape format to allow a better presentation of the superyachts featured with larger pictures. Apart from listing some of the finest yachts available for charter, there are destination guides to to the world's most exotic cruising areas.